Some time ago, I found a photo of the most delicious looking baked potato on themetapicture.com (click for original photo). I figured, how hard can it be? Well — my potatoes came out NOTHING like it. I bet the Pinterest photo is actually really delicious, but I thought my potato came out pretty tasty as well. And as you can see, I don’t think the photo is necessarily cringe-worthy like so many other ‘Nailed it’ attempts! Basically, I sliced one large, golden yukon potato and stuffed the slices with even thinner slices of butter, cheese and sea salt. I baked the potato in the oven for about half an hour at 400 degrees Fahrenheit. I would probably suggest actually “pre-baking” the potato a little bit first, then slicing it, adding the fixtures, and then baking again for maybe an additional 15 – 20 minutes. My initial potato came out a bit raw. 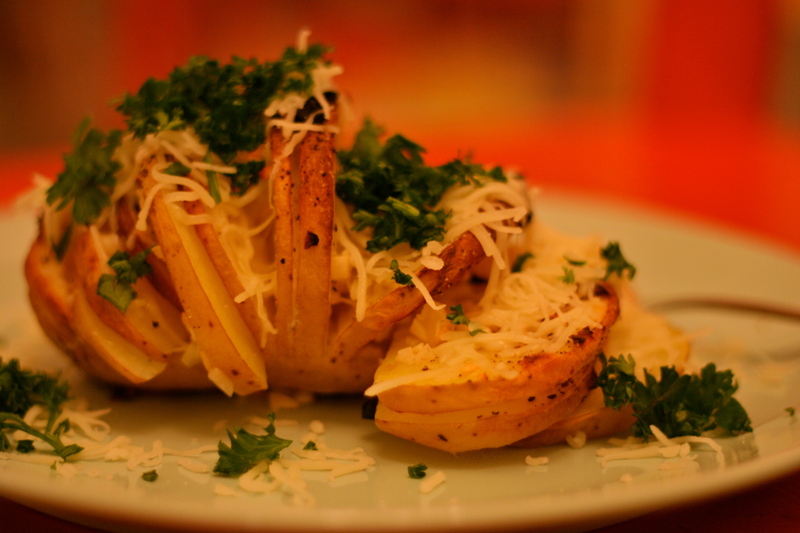 I used shredded Emmentaler cheese, so you may get a more gooey potato if you use a different cheese. Some may choose to drizzle the potato in olive oil, but I totally embraced the butter and you don’t really need the oil after that. I embraced the butter. EMBRACE the BUTTER. 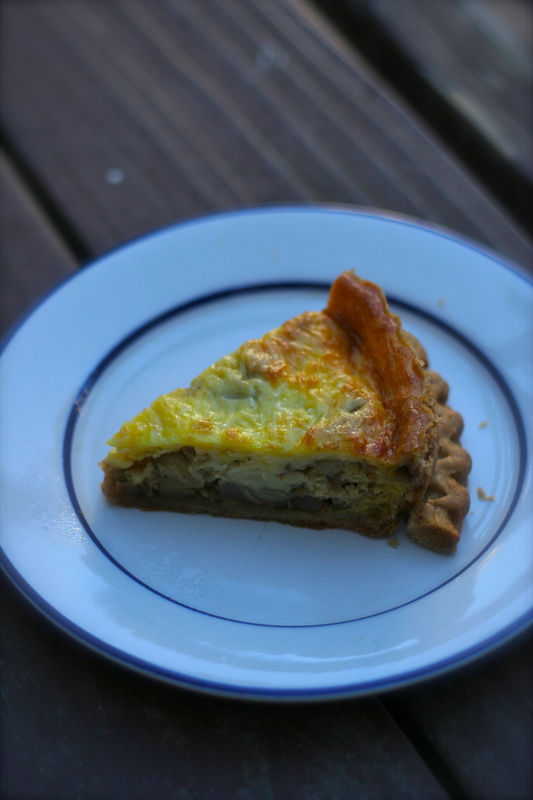 A hearty quiche to warm your heart! 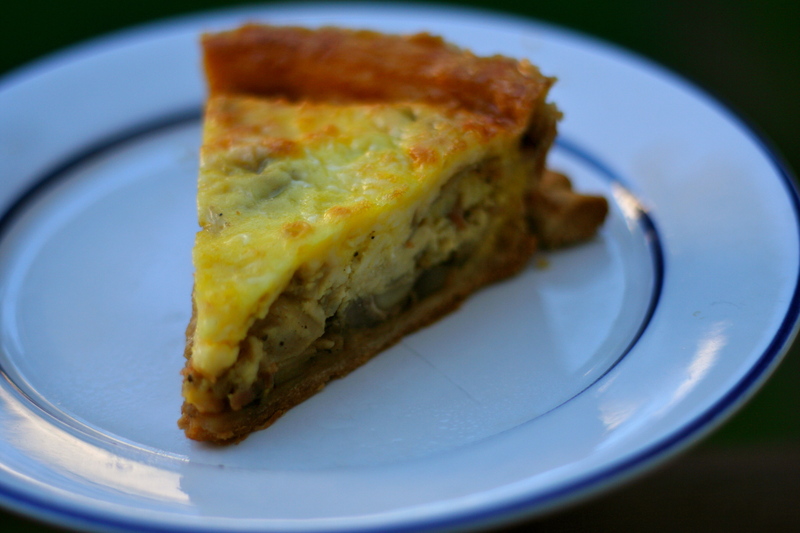 I love quiche. I really do. They are so easy to make and you can pretty much put everything and anything in ’em. This dish was inspired by something by Emeril Lagasse, but I made some hefty changes to make it much more un-healthy. First off, the original recipe called for about 6 ounces bacon. Do you know how much bacon that is? I do — I measured it. And it’s SO not enough for this meat-eating gal! I used a whole pack instead. Make what you will of that. This could just as easily be a vegetarian dish as well, but like I said: I luuuurrrvvveee meat. With my additions, the recipe ended up filling up 2 ready-made 9 inch pie plates, so I would suggest making this for you and your friends or else you’ll be eating it for the rest of the week. Heaven forbid, you get sick of quiche! The onions, I also ended up cooking longer than suggested by Mr. Lagasse, but only because I prefer a more slightly caramelized (burned?) onion. I love onions. I love bacon. And I love mushrooms. This dish was pretty perfect for me. I hope it will be delicious for you as well. Happy eating! In a saute pan, over medium heat, cook bacon. Drain slices on paper towel. You might want to save some of the bacon fat to cook the rest of the ingredients in. Sounds fatty, I know, but it tastes good. Once cooled, chop into quarter inch pieces. Add the onions to the pan and cook, stirring occasionally until the onions are wilted and lightly caramelized (about 8 minutes). Add the mushrooms, thyme and garlic to the pan and season with salt and pepper. Cook everything together until most of the moisture has cooked out of the mushrooms (about another 8 to 10 minutes). Remove pan from heat and allow the onion/mushroom mixture to cool (about 10 minutes). In a medium bowl, combine 1/2 cup heavy cream and 5 of the eggs. Stir in one pack of the shredded cheese. Stir in about half of your chopped bacon and then stir half of the onion/mushroom mixture. Pour this into one of the pre-made 9″ pie plates. Repeat this step for the second pie plate. Bake both pie plates on a cookie sheet for about 35 minutes, but start checking at around 20 minutes. A very kind and generous woman from Austria once taught me how to make Palaschinken (pretty much a crepe, but it would seem that every country in Europe has some version of it. 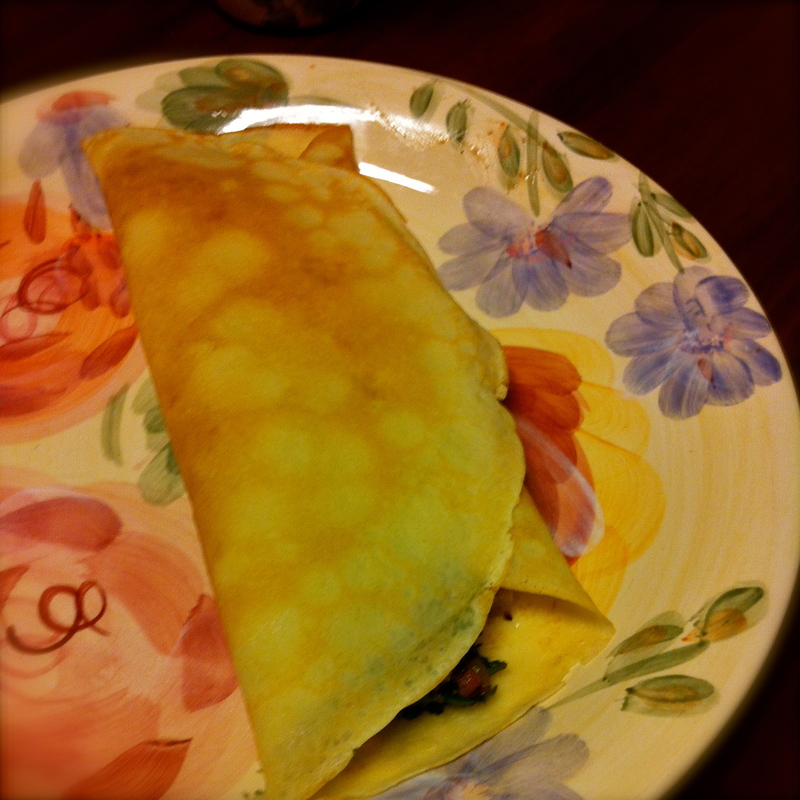 Crepes from France, Palaschinken from Austria, Pfannkuchen from Germany — either way, it is delicious). I practiced and practiced until I got the flavor and consistency of the dough just right. Some time later, a good friend from Germany showed me how to improve my technique. Well, now, I’ve found that I have gotten good enough that I tend to make this dish almost once or twice a week and you can stuff it with all sorts of good eats! The recipe itself is quite simple. All you need are eggs, flour, milk and a touch of salt — see below. In a food processor (or whisk by hand), combine egg, milk and butter. Add salt for taste. I start off with about half of a tablespoon. Add in flour about a third of a cup at a time. This took me the most practice, as you just have to ‘feel’ the consistency of the dough. It should be pretty liquid, but dense enough that it sort of oozes down the sides of your mixing bowl. If it looks like pancake batter, it’s too thick and you need to add more milk (possibly another egg if it just looks like you have doubled your batch). Use a 10″ non-stick frying pan and make sure it is quite hot before pouring in batter. One ladle full is usually enough for this size of pan. When ladling in the batter, I would advise actually holding the pan in your other hand and tilting it in a circular motion to line the bottom of the pan. That way you will end up with a pretty perfect circle that is still thin. The pan should be hot enough that almost as soon as you pour the batter in, it is already starting to cook. 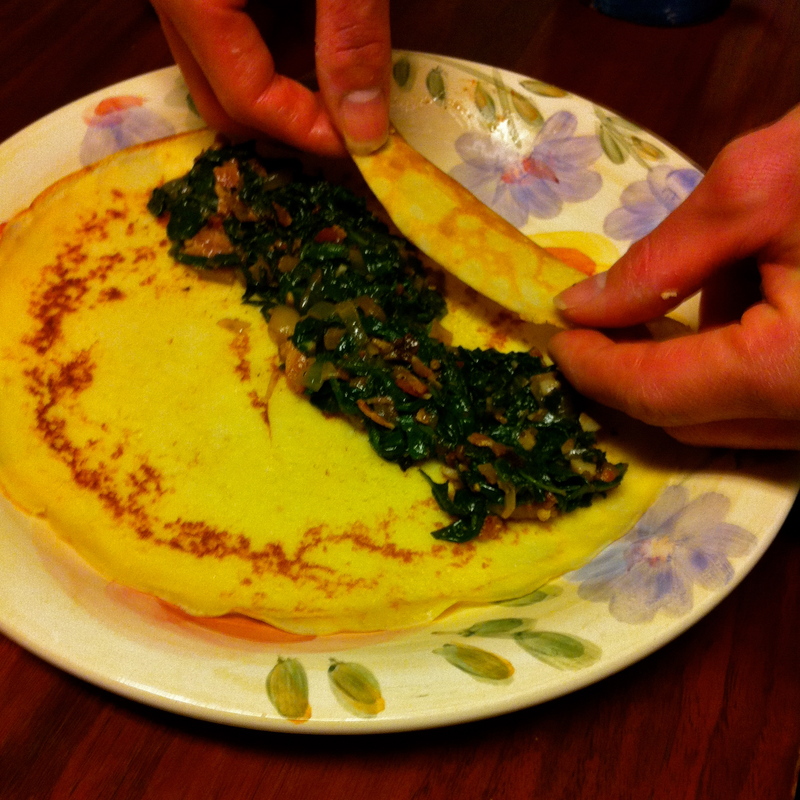 Use your spatula to carefully lift up the edges, work your way under the crepe/Pfannkuchen and flip! This will take practice — if your first attempts at this crepe/Pfannkuchen/Palaschinken ends up as just one big, torn up mess, then no worries. It happens to us all! Apple Pie in a Jar (recipe) smothered on the inside, melted Nutella poured on the outside. Total win. Ham and sprinkled cheese. I like using either gruyere or emmentaler. There is a popular soup in both Germany and Austria called Frittatensuppe that is basically this crepe, shredded, and dropped into a vegetable or chicken stock broth with small veggies and sometimes a meatball. It’s my favorite soup and I must have it every chance I get to go over there. The Thoughts and Tribulations of a Socially Inept 20 Something.